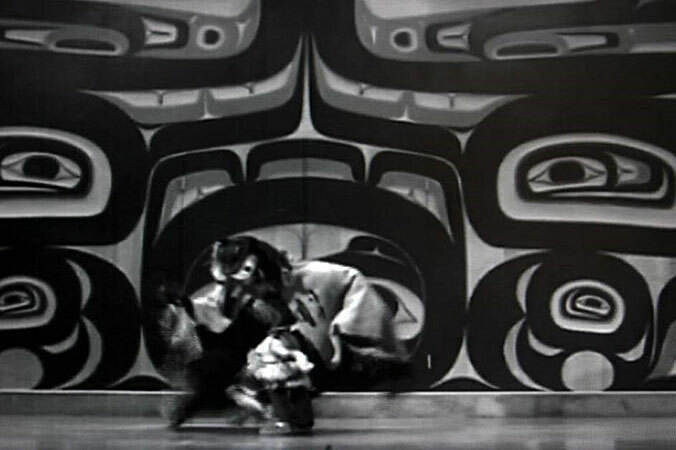 Nicholas Galanin (Tlingit, b. 1979), Tsu Heidei Shugaxtutaan (We will again open this container of wisdom that has been left in our care), 1 and 2 (video still), 2006. Digital video projection with sound. Courtesy of the artist. Transformer: Native Art in Light and Sound presents the work of ten artists who use light, digital projection, and experimental media to reflect on their place in and between traditional and dominant cultures. Through video projections in and outside the galleries, innovative sound art, interactive digital media, performance, and installation, the exhibition demonstrates the continuity of indigenous cultures and creativity in the digital age. The artists use nontraditional media and colorful and dynamic forms to draw viewers into a world of indigenous experience, insight, and invention that is at once ancient and adapted to the moment. Artists featured in Transformer include Jordan Bennett (Mi'kmaq), Raven Chacon (Diné), Jon Corbett (Métis), Marcella Ernest (Ojibwe), Stephen Foster (Haida), Nicholas Galanin (Tlingit), Julie Nagam (Anishnawbe/Métis), Marianne Nicolson (Kwakwa?ka?’wakw), Keli Mashburn (Osage), and Kevin McKenzie (Cree/Métis). The project is curated by Kathleen Ash-Milby (Diné), National Museum of the American Indian, and David Garneau (Métis), University of Regina; an illustrated booklet accompanies the exhibition. Transformer: Native Art in Light and Sound and related programming are made possible through the generous support of the members of the New York Board of Directors of the National Museum of the American Indian.